The shuttle Discovery closed in on the international space station early Saturday, on course for a docking around 2:16 p.m. The terminal phase of the rendezvous begins at 11:33 a.m. when commander Steven Lindsey and pilot Eric Boe fire the shuttle's maneuvering rockets to begin moving in from a point about 9.2 miles behind the space station. A few minutes after 1 p.m., Discovery will briefly halt its approach about 600 feet directly below the space station. At that point, Lindsey will oversee a computer-assisted 360-degree back flip maneuver, exposing the shuttle's belly and critical heat-shield tiles to the crew aboard the station. Expedition 26 flight engineers Catherine "Cady" Coleman and Paolo Nespoli will film the maneuver, using 400 mm and 800 mm telephoto lenses respectively, to capture high-resolution photographs of Discovery's heat shield tiles. The images will be downlinked to analysts in mission control at the Johnson Space Center for detailed evaluation. During Discovery's launching Thursday, several pieces of foam insulation fell away from the ship's external tank, including some that appeared to contact the shuttle's heat shield. The foam shedding occurred well after the first two minutes and 15 seconds of flight when the dense lower atmosphere can cause debris to hit with a high relative velocity. Engineers do not believe the foam lost Thursday caused any significant damage, but the photos shot during final approach Saturday will be carefully scrutinized to make sure, and to look for anything else that might need attention. It will take about 10 minutes to complete the rendezvous pitch maneuver. After that, Lindsey will guide Discovery in an arc up to a point about 300 feet directly in front of the space station with the shuttle's nose pointed toward deep space and its open payload bay facing the front end of the lab complex. From there, Lindsey will carefully guide Discovery in to a docking at pressurize mating adapter No. 2 on the front end of the station's Harmony module. 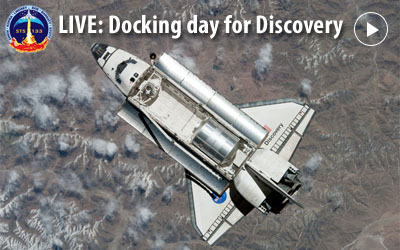 It will be Discovery's 13th and final docking with the International Space Station. After the docking mechanism locks the two spacecraft together, hatches will be opened shortly after 3:30 p.m. and the station crew -- Expedition 26 commander Scott Kelly, Alexander Kaleri, Oleg Skripochka, Dmitry Kondratyev, Coleman and Nespoli -- will welcome Lindsey, Boe and their shuttle crewmates -- Al Drew, Stephen Bowen, Michael Barratt and Nicole Stott -- aboard. After a mandatory safety briefing, the shuttle astronauts will get to work transferring spacesuits and other gear to the station. Barratt and Stott, operating the station's robot arm, plan to pull a cargo pallet out of Discovery's cargo bay just before 5 p.m. The pallet, known as external logistics carrier No. 4, is loaded with a spare set of radiator panels for the station's ammonia cooling system. ELC-4 will be mounted on the underside of the station's right-side solar power truss. To get it there, Barratt and Stott will hand it off to the shuttle's robot arm, operated by Boe and Drew. The station arm then will be repositioned, inchworm fashion, moving from the Harmony module to its mobile base work station. When the move is complete, the shuttle arm will hand ELC-4 back to the station arm and the pallet will be mounted on the solar power truss for future use as needed. A mission status briefing is planned for 4:30 p.m. The crew will go to bed shortly before 11 p.m.